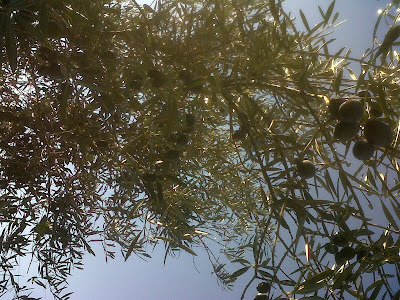 Two days ago (Tuesday) C and I picked a large amount of olives. 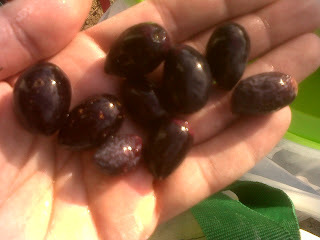 This is the first time we have harvested them. Some were rather wrinkly, but apparently this doesn't matter. The ones further to the top of the tree were big, black and shiny. We hand picked most of them as we didn't have any old bedsheets big enough to place under the tree! 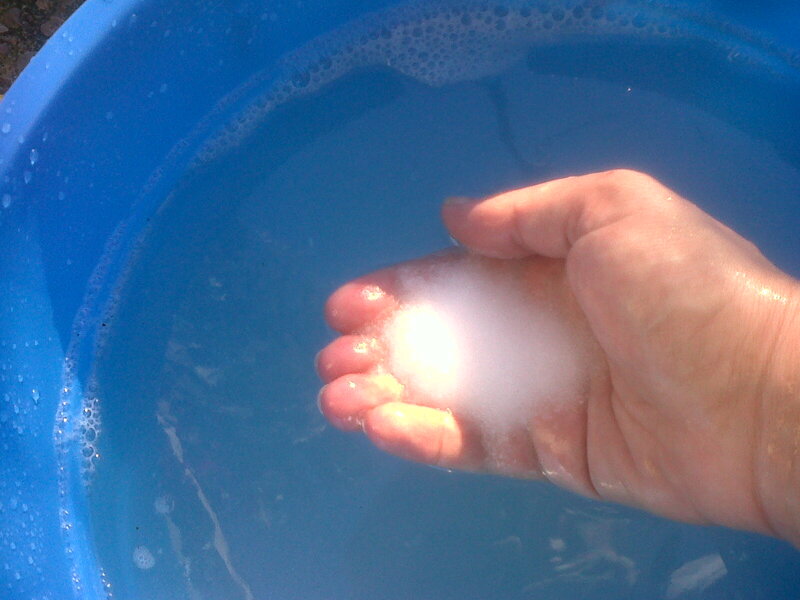 Once we had a batch I washed them thoroughly and took out any obvious nasty ones I could find. 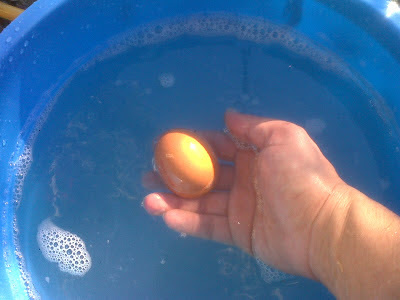 I then filled a 21l bin with fresh cold water and placed a fresh egg into the bottom of the bin. Then I began to add salt, when there was enough salt in the bin the egg floated to the top. I added all the olives, sealed the lid and put them in the utility room. Because we always do things before really reading up on them!!! 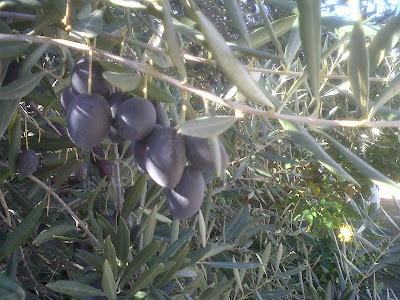 I then went to the internet to glean a little more information about how to pickle/store olives from the tree. It was at that point I realised I should have sorted through them more (to remove any wormy ones! yuk) and you are supposed to change the water every day for up to 2 weeks, or until the bitterness has gone from them, THEN..put them in salt water, with added lemon etc. DOH! Well, I decided I'd had enough for the day and thought I would do it yesterday (Wednesday). I didn't get a lot else done today, by way of gardening & animals. Our hens are still laying, although it is still a little sporadic, and some of the eggs are getting cracked because the hens kick the straw out from the nest boxes, so we need to keep an eye on that and perhaps try to find a different bedding for them! 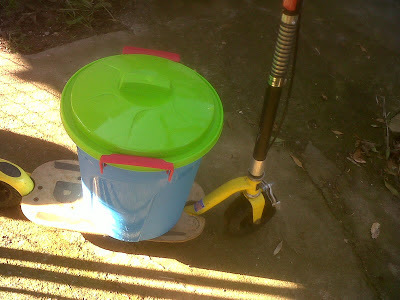 This morning, I finished pruning the vines - I only had one left to do, so that's another job done. 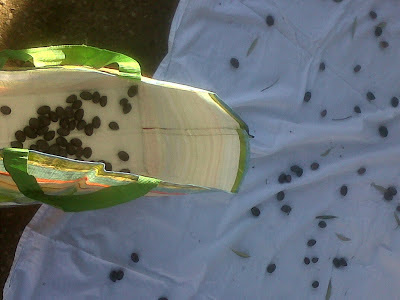 I changed the water the olives are in and searched carefully through each fruit to check for wigglies! I threw quite a few out, but actually we still have LOADS left. 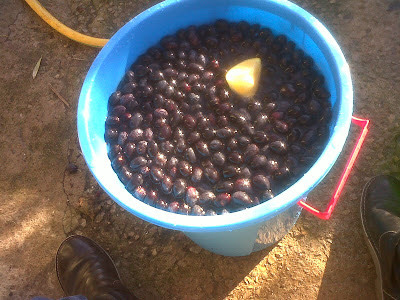 We need to pick the last batch over the next day or so, these I will attempt to dry cure instead of putting them in brine. 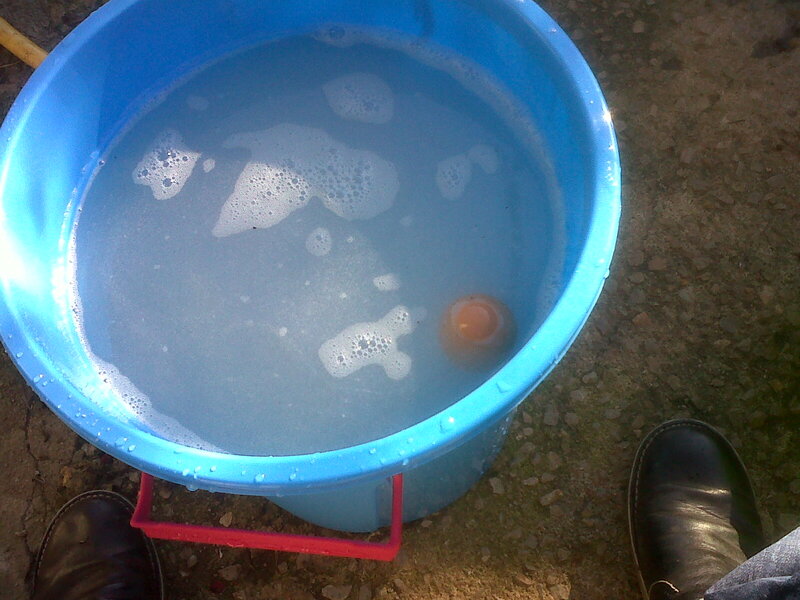 Place a fresh egg into the bucket/bin with the fresh water. It will sink - only rotten eggs float! Then throw in your olives with any seasonings you want, I chose lemon. Then transport to a dry, cool place. As mentioned I was premature in putting them straight into salt solution, so I re-washed and sorted them and now they are in water, which, I will change every day till a lot of the bitterness has gone. 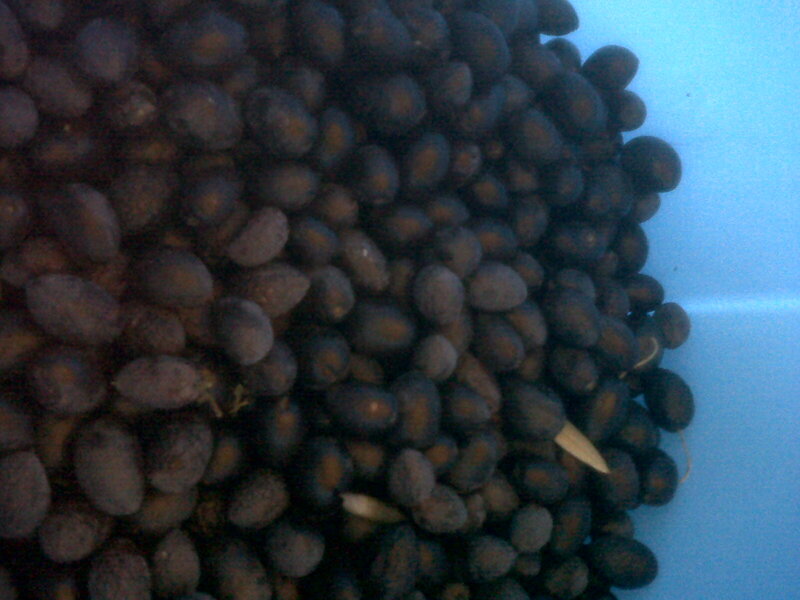 Straight off the tree olives are very bitter and not at all pleasant to eat. This is why they are soaked, pickled and marinaded. They should be ready in about 3 weeks or so and should last us through the summer. We've had spectacular sunny days here for the last week and a half - or longer, I forget. Long may it last, although the plants could do with a deluge.